Have you ever combined beets and strawberries in the same recipe? This might surprise you, but they are meant to be together – a match made in joyous heaven! Why? 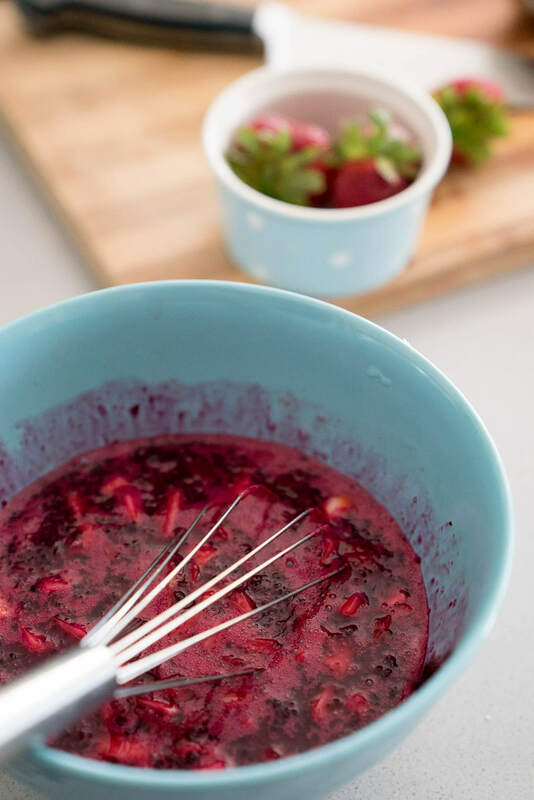 The strawberries soften the strong “earthiness” of the beets and lend a lovely natural sweetness to this recipe. Surprisingly, the strong taste of the beets does not overshadow the strawberries. This recipe made me giddy with excitement to share with you because the muffins are SO GOOD. As you can see in the photos, the batter was so vibrant and rich thanks to all those phytonutrients (more on that in a bit). These muffins were a food stylists dream to shoot because the gorgeous colour looked great with any set of dishes. Walker and I had so much fun shooting them, as evidenced by the ridiculous amount of shots we got (we could only post a few here)!! As for the taste, I knew they were be going incredible when I dipped my finger in the batter to taste test it and I was like “wowza.” When I pulled them out of the oven, my test-tasting-buds were correct. 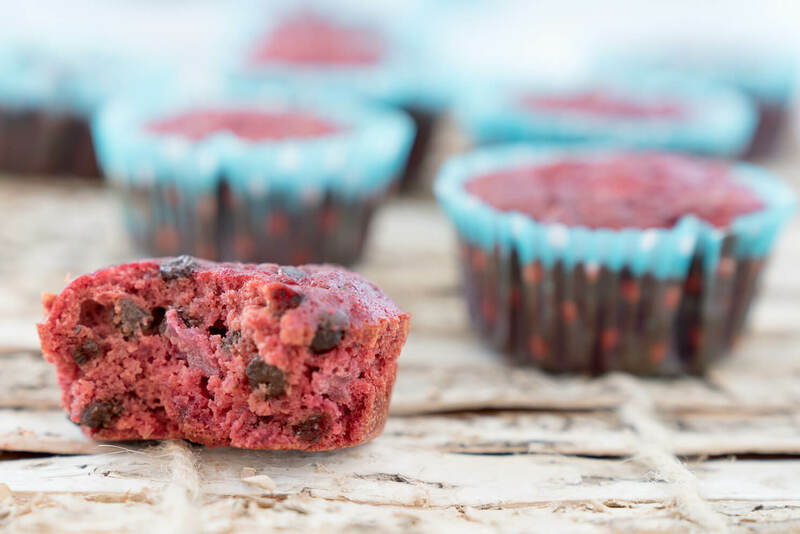 They were AMAZING – moist, flavourful and the beet/strawberry combo was perfection. 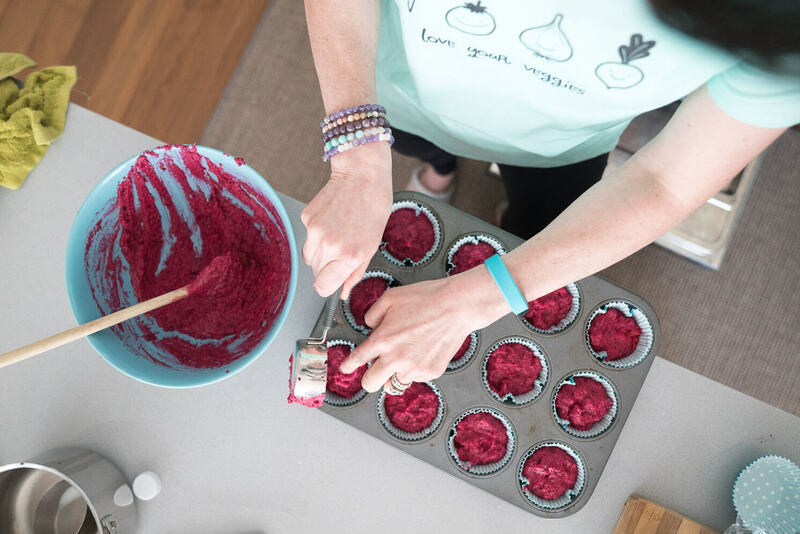 You’ll be happy to know these muffins are gluten-free and digestion-friendly because I used Genuine Health’s Fermented Greek Yogurt Proteins+. You can learn more about this protein by checking out this cool infographic. As for the benefit of fermented foods, you’ll already know them all if you’ve read my previous posts and watched this video, but here’s a little reminder. Fermented foods help feed the good bacteria in your gut. These little guys help produce certain vitamins and keep bad bacteria in check. Fermented foods are easier to digest and help prevent bloating. When fermented foods boost the levels of good bacteria in your gut, they also boost your immune system. Check out the highlights on beets and strawberries below after the recipe card! Combine the dry ingredients together in a large bowl: flour, protein and baking powder. In a separate bowl, combine all the wet ingredients in a separate bowl: beet puree, strawberries, maple syrup, coconut oil, eggs, almond milk. Combine wet and dry ingredients into a large bowl. Fold in chocolate chips if using. Bake at 350 degrees F for 30-35 minutes or until a fork inserted into the middle of the muffin comes out clean. *If you don't have this brand of protein powder, you can substitute another brand of protein powder. 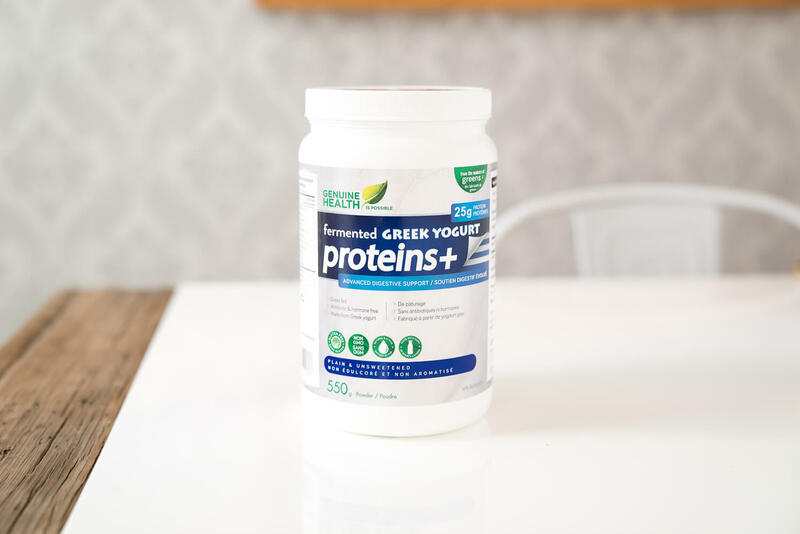 Just keep in mind this protein is sweetened naturally with monk fruit and stevia so you'll want to be sure the batter is sweet enough if you make a substitution. Alternatively, you can substitute 1/4 cup brown rice flour. I haven't tried the recipe with brown rice flour, but it should work. 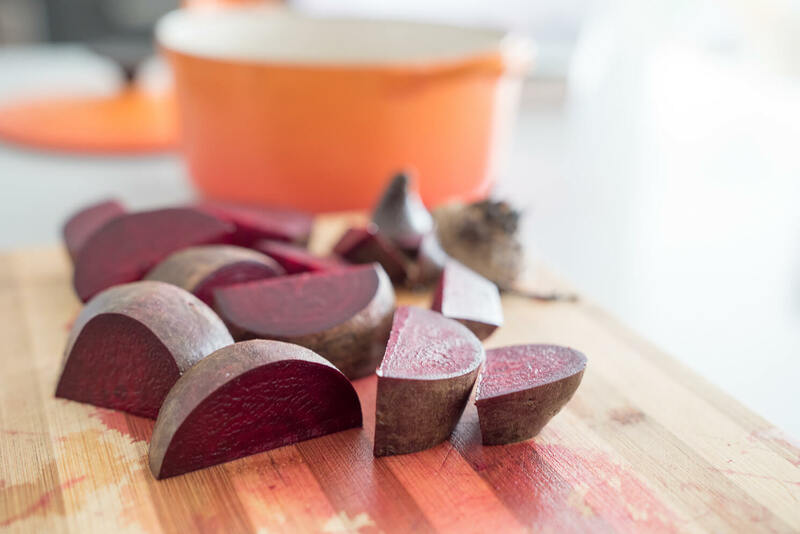 **To make the pureed beets, cut 2 medium organic beets into chunks and roast for 45 minutes at 350F in a dish with a lid or until fork tender. Once cooled, puree in a food processor until smooth (see photo below). Note: FYI — I’ve been getting questions asking me why my muffins are so red. No, I did not add any food colouring. I bought certified organic beets and roasted them with the SKIN-on and pureed them as you see below. My hubs does all my photography and he didn’t add any filters. Beets contain anti-inflammatory phytonutrient betalains that support phase 2 liver detoxification. They are high in detoxifying fibre. Beets are a great source of folate, which is important for cell growth and metabolism. You can use the whole beet if it’s organic, but if you’re using conventionally grown beets, make sure you peel them first to get rid of extra pesticide residues. At 91% water, strawberries have the highest water content of all the berries, and are therefore the most hydrating. Strawberries have the most antioxidant vitamin C of all “berries” (even thought strawberries aren’t technically berries, they’re drupes). Strawberries are also a great source of folate. Remember that strawberries are right at the top of the EWG’s 2016 Dirty Dozen list, so you’ll want to make extra sure to buy organic if at all possible! You can enjoy these as part of a healthy breakfast with this Sunshine Juice or as a mid-afternoon powersnack. I hope you love them as much as Walker and I do. Hi Joy, These look delicious! Can you have the protein powder while pregnant? Could you substitute Genuine Health greens+ kids for the protein powder or is it totally different? I'm making this for my kids and have the greens+ on hand. The texture might be a bit different. I would substitute another protein or use brown rice flour instead of protein for texture. Hope that helps! These look delicious! Any chance you could provide the nutritional breakdown? As a Type 1 Diabetic, I am really careful about counting for everything. I count for all carbs, sugars (even natural) protein and fiber content. Thanks so much! Is it possible to use beet pulp after juicing? We try to use all our pulp-no waste. But I wonder if that would affect the moisture content in this case? Just made these- they are delicious!!!! And so pretty. used white rice flour instead of protein powder - it was no problem. Mine didn't come out half as red as yours Joy! Did you cheat with colouring ;-) Quite yummy and super nutritious though. Thanks for the recipe. Ha! No. I would never ever use food colouring! I blended my beets (as you can see in the photo to be pretty smooth). I added a touch of water to my Le creuset pot when I roasted them so they didn't dry out which ended up being blended with the beets. That could be why. Hello, I love beets and am excited to make this recipe! I usually buy my beets already cooked (they come vacuum sealed). Would this work or do the beets have to be roasted? Thank you! Yes that will totally work! I hope you enjoy it Vanessa! I made the recipe with vegan chocolate-flavoured protein powder and they turned out very tasty. I only used 4 eggs, since that's all I had on hand. The muffins turned out just a little crumbly, maybe due to the missing egg? This recipe is a definite do-again. Thanks! Hi- I have been wanting to add more beets to my life for their health benefits but I haven't because I don't really like them just roasted. This recipe may change things. I had three questions: first will beets stain my food processor, second do you have any other recipes using that protein. And lastly, if I make these not in strawberry season, do you think frozen, thawed strawberries would work? Thank you! Hi Ruthie! 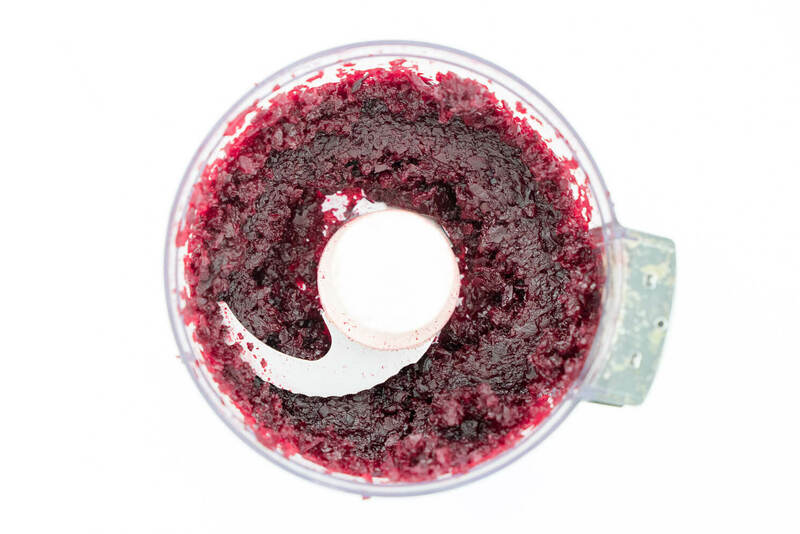 You shouldn't have any issues with the beets staining your food processor and yes we do have other recipes on the blog that use this protein powder (it's our favourite). We use it in most of the smoothie recipes, other muffins and these awesome Protein Blondie Squares: http://www.joyoushealth.com/blog/2016/03/08/protein-blondie-squares/ As for the strawberries, you could try using thawed strawberries, just make sure to drain off the excess liquid really well as it may change the consistency. Good luck! Hi there, so I just made those muffins, I use brown rice flour instead of the protein powder so I had 1/3 cup of maple syrup ( and for me it was too much) I ended up having only 1/3 cup of beets puree even with 3 beets so they are not as red as yours but really pretty! I also just put 4 eggs instead of 5 and they work great. Have a good day ! Awesome Mylene! Glad they worked out with the modifications you made! I cannot have berries so could I add another fruit or maybe just go with beets? Hi Joy, Made the first batch with the Italian beets I had on hand. Tasted good but not the nice bright red colour. Making them again today with regular beets but wondering what you thought of substituting goat milk for the almond or coconut. 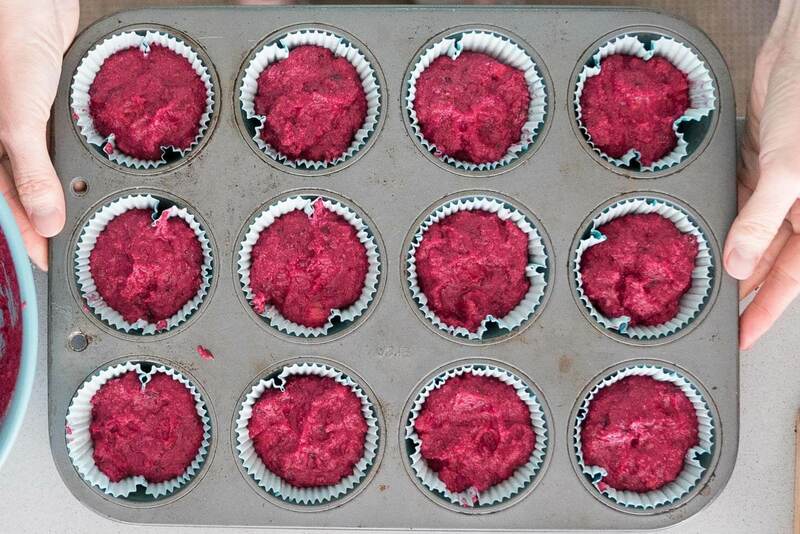 My beet muffins are very "wet" when baked. Do I need to bake longer? I've gone as far as 45 minutes. I attempted this recipe with the suggestion of using 1/4 c of brown rice flour instead and they came out super oily, could you suggest what I could try next time? I love that protein powder I bought it when I saw you speak in newmarketbut since my food sensitivity test, I can't have cow milk, pea , casein, wheat, flax a few nuts, etc. and egg,, can you suggest a substitute powder that I can have in a smoothie fermented would be a bonus and that I can make these muffins with ? do they taste beets? :). never been a huge beet fan but would like to try tnx. sue. I really appreciate Joy’s muffin recipes. I’m looking forward to making my own popsicles. Thanks.